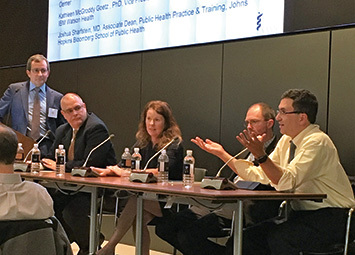 In its efforts to provide additional support to grantees, Donaghue joined with AAMC to host “The Current State and Future Vision: Making EHRs Work for You” summit at the AAMC Learning Center in Washington D.C. this past October. The summit brought together approximately eighty participants, among them chief medical officers, chief information officers, chief quality officers, leading researchers from health systems, along with representatives from government agencies, nonprofit organizations, and foundations to identify opportunities for improving the EHR function that support the advancement of learning health systems. This summit was developed as a component of the Donaghue-AAMC partnerships that supports research on learning health systems and academic-community efforts to improve population health. Several Donaghue grantees from this and other programs attended the summit. The summit opened with researchers from three different health systems sharing their experience using health informatics to conduct innovative and interdisciplinary studies. Jeffery Gold, MD, highlighted the value of adopting an EHR simulation tool to evaluate and train healthcare professionals while identifying safety and processing errors in EHR use. Jeffery Kullgren, MD, resented how analyzing EHR orders can help identify where low-value services are ordered and provide opportunities in facilitating high-value healthcare decision-making. Simon Mahler, MD, introduced an EHR tool, the HEART Pathway, which identifies patients eligible for early discharge from emergency departments. He also described a related app that offers a scalable solution and EHR integration. Next, participants heard from Christopher J. Alban, MD, MBA, from Epic and Bharat Sutariya, MD, from CERNER who each shared their perspectives on the capabilities and goals of future systems. Vivian Singletary, MBA, provided an overview of Digital Bridge, a partnership among healthcare and public health organizations that are implementing electronic case reporting across the country. David Grabowski, PhD, then discussed the importance of EHR linkage with post-acute care and long-term care systems. He identified the barriers to achieving inter-operability and discussed policy options moving forward. Summit attendees had the opportunity to discuss and debate what issues related to EHR research and analysis they found most relevant to advancing learning health systems. After working in small groups, attendees posed questions to an expert panel, which included earlier speakers and Kathleen McGroddy-Goetz, PhD from IBM Watson; Peter Eckart, MA, Illinois Public Health Institute and Co-Director, Data Across Sectors for Health (DASH); and Joshua M. Sharfstein, MD, Bloomberg School of Public Health. Standardizing outcome measures in EHRs to support interoperability. With the summit as a kick-off, AAMC launched the EHR optimization discussion group, which is composed of leaders from academic health systems, the research community, and EHR vendors who are dedicated to identifying best practices in EHR implementation and performance improvement. AAMC will lead this group when gathering best practices related to the themes that emerge from the summit and when developing policy papers and advocating for issues related to EHR optimization within learning health systems. Donaghue and AAMC host summit on opportunities for improving the EHR function that can support the advancement of learning health systems. Another in a series of articles that revisits the Donaghue Investigator program and its awardees. The Connecticut Choosing Wisely Collaborative hosts summit that explored opportunities for using Choosing Wisely® resources as a tool to empower and engage underserved populations to receive safe and effective care. Michelle Spoto has recently joined the Donaghue Policy Advisory Committee for a two-year term. With its four 2017 Greater Value Portfolio awards adding to the seven previous awards, Donaghue has committed $6.4 million for studies demonstrating how a higher-value healthcare system can be achieved. In its fifth year of awards for research on elder health in care facilities, Donaghue awarded $250,000 in the fall of 2017 for two studies. We’ve updated our website. Check us out! Wouldn’t it be great to be able to ask Ethel Donaghue a few questions? Will there be another GVP grant program this year? Which would you prefer to receive? If you like getting the printed Practically Speaking in the USPS mail and you’re reading this because you had one mailed to you, no need to do anything – you’ll continue to get each issue mailed to you. If you’d prefer to only receive the emailed version, please let us know that. You can contact us at office@donaghue.org or call 860-521-9011 to give us your email address.